The announcement of what amounts to the first book publishing program spawned by Google demonstrates a paradigm we’re seeing repeatedly. It suggests a sweeping change in publishing from how we’ve known it. The bottom line is that most people employed publishing books perhaps as soon as 10 years from now won’t be working for publishing companies. The trade publishing business over the past twenty years has been transitioning from what it was for a century. The Internet, which so many of us said two decades ago “changes everything” is ultimately responsible. Amazon.com has been the primary catalyst, with print on demand technology (especially Ingram’s Lightning Source) and ebooks (mostly Amazon, but others too) as supporting players. With so many more books to choose from and really available than there ever were before, the function of gatekeepers, which trade publishers and booksellers clearly and proudly were, becomes an anachronism. The big question — at least for me — is what is trade publishing transitioning to? What does the trade publishing world look like when it doesn’t primarily reach readers through bookstores anymore, a day which one could say has already come in the past five years. Overall trade sales today outside of special outlets, catalogs, and what remain of book clubs divide into three big chunks: one is printed books sold in stores, one is printed books sold online, and one is ebooks. The latter two are sold without stores, and far more than half of that is sold by Amazon. And that is the way it is most helpful to think about sales because it is only print-in-stores that requires (or benefits from) a big publishing organization. What the latest Bowker information has to say, lumping ebooks into “online commerce”, is that 44% of sales are online, 32% through physical retail, and the remainder through book clubs and warehouse clubs (physical retail to me!) and “all other channels”. But they also report that 30% of sales are ebooks, which would mean that they’re only calling 14% of the remaining 70% online. There are a lot of ways to count these things, and the resulting calculation of 20% of print sales being online feels very low to me. It all depends on what kind of book we’re talking about, of course. I visualize the market breaking into thirds among the three chunks. Certainly, one-third ebooks is an understatement for fiction. However we view the current division of sales, the trade book business was built in a completely different environment. Indeed, the central proposition that all publishers offered all authors is ” we put books on shelves.” The companion reality was “you can’t do this by yourself”. As recently as 2007, before Kindle, there were no ebook sales and upwards of 85% of print was sold in stores. The requirements to deliver on the promise “to put books on shelves” included the capital to invest and specialized knowledge to turn a manuscript into inventory, a physical plant to manage the warehousing and shipping of those books, and a network of relationships with the owners of the shelves (in the bookstores) to get the right to put your books on those shelves. These were the minimum requirements to be a publisher. If you had them, you could move on to being smart about selecting books (in the case of non-fiction, almost always before they were were completely written), being skilled at developing them, being capable of packaging them attractively, and being managers of another network — of reviewers and broadcast conversation producers and, more recently, bloggers and social megaphones — to bring word of them to the public. All of this together gave a publisher the capability to pay authors advances against what amounts, for all but the very biggest authors, to a minority share of the revenue the book generated. But, in fact, the central proposition has lost its power. Only a quarter to a half of the sales now — far less for fiction and far more for illustrated books — require a publisher to “put books on shelves”. And that number is going down. For the balance, no inventory investment is actually necessary. Nor is a physical plant or a vast network of sales relationships. And, without that requirement, the barriers to entry to becoming a “book publisher” have collapsed, particularly if you’re willing to start with ebooks and think of print as an ancillary opportunity. Google is becoming one. Amazon became one a long time ago. NBC has become one. The Toronto Star and The New York Times have become ebook publishers. And, of course, so have many tens of thousands of individual authors, a few of whom are achieving startling success. Soon — in the next 5 or 10 years — every university (perhaps most departments within a university), every law firm and accounting firm and consulting firm, certainly every content creator in other media, as well as most manufacturers and retailers will become book publishers too. Why not? Without the requirement of an organization to reach the public through bookstores and without the requirements of capital or knowledge to create printed books, any organization that is routinely reaching people interested in a common topic — whether or not they are creating content around that topic now, but especially if they do — will find it constructive to publish, and well within their reach and means to do so. That is: publishing will become a function of many entities, not a capability reserved to a few insiders who can call themselves an industry. Think about it this way. If you had told every museum and law firm in 1995 that they needed a web page, many would have wondered “what for?” If you had told them in 2005 that they needed a Facebook presence or in 2008 that they needed a Twitter stream, they would have wondered why. We’ve reached the moment when they all need a publishing strategy, and that will be as obvious to all these entities in a year or two as web pages, Facebook pages, and Twitter streams look now. This is the atomization of publishing, the dispersal of publishing decisions and the origination of published material from far and wide. In a pretty short time, we will see an industry with a completely different profile than it has had for the past couple of hundred years. Atomization is verticalization taken to a newly conceivable logical extreme. The self-publishing of authors is already affecting the marketplace. But the introduction of self-publishing by entities will be much more disruptive. Publishing is not immune to the laws of supply and demand and the price of books is tumbling. Most self-published fiction is crap, but a small percentage of a very large number of self-published novels constitutes a significant range of good cheap choices for fiction readers, particularly in genres. That “diamonds in the dirt” effect has been becoming more and more evident with the passage of time. Recently, the Digital Book World bestseller list (compiled by ioByte’s Dan Lubart in conjunction with our friends at DBW) had a self-published book in the top slot for the first time. It won’t be the last time. Publishers still have plenty of capabilities that are enticing to authors. There are still stores with shelves on which to put books. And big publishers can build on that increased presence very impressively; it is hard to believe that “Fifty Shades of Grey” would have sold the tens of millions of copies that it has as a self-published book. Random House made a quantum difference. But perhaps we shouldn’t read too much into that. The publishers’ power to use that capability to command a share of the “easy” (no inventory investment or sales force required) money from ebooks, which was a sine qua non for them until very recently, is evaporating. When Hugh Howey was in the early stages of what has turned into his eye-popping success with the novel WOOL, publishers would only offer him a deal to publish print if he also gave them ebook rights. Howey and his agent, Kristin Nelson, found those offers easy to resist, since he was making so much money on ebooks and publishers would have wanted a healthy share of it. A few months later, Simon & Schuster (wisely, in my opinion) agreed to give Howey a print-only deal for US rights. Of course, there is, or at least there can be, a lot more to publishing than just making good content available and making the people you know already aware that it is there. (Although, increasingly, that will be seen as “enough”, along with ancillary benefits, to make it worth the effort to many entities.) There are rights to be sold. 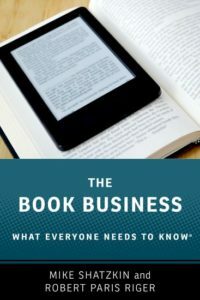 There are ways to market to “known book buyers” that are increasingly going to be the property of entities that have developed lists and techniques at scale. So there will continue to be a trade book business and it is likely that the machinery of the biggest book publishing organization (or two) will be required for a very long time to maximize the biggest commercial potential, like “Fifty Shades of Grey”. But, without a robust “book trade”, from which trade publishing gets its name, there cannot be commercially robust trade publishing, at least not as we have known it. The “network”, of course, was the Internet. He was envisioning direct-to-ebook publishing and automated blogs-to-books publishing as well as a lot of customization. He was right. And the atomization I think may be the overarching trend of the next decade or two fits right in. Once the concept of the atomization and dispersal of the publishing function becomes understood, you see it everywhere. Aside from the Google-spawned publishing program — which is built around their massive multi-player game activity, but there are many other applications once they get used to this idea — we had a library announce a new digital press last week. We’d already been putting together a panel of new entrants to book publishing for our Publishers Launch BEA conference on May 29. Of course, the atomization we talk about here is enabled by the scale being provided by others, including service providers. And the major houses are trying their hardest to build marketing at scale. Ken Michaels, the President and COO of Hachette, and David Nussbaum, the Chair of F+W Media, are our first two confirmed speakers about that. We’ll have a panel of literary agents talking about how they’re tackling the need for scale to help clients with an increasingly broad range of choices for publishing.